Nick Fisher (B.Mus, B.Ed, M.Ed) – currently teaches music at Truro Junior High School. He also directs the Cobequid New Horizons Jazz Band and is an active performer on saxophone and other woodwinds. Nick holds degrees from St. FX and Acadia universities. Beginning in 2017, Nick has assumed the role of Program Director for Nova Scotia Honour Jazz. 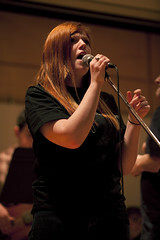 Robyn Alcorn-Martin – vocalist, multi-instrumentalist and educator, began her post-secondary studies in Luzern, Switzerland. After her year abroad, Robyn completed her undergraduate studies at McGill University and St. Francis Xavier University. Directly after her undergraduate studies, Robyn moved to Newfoundland to complete her music education degree at Memorial University. Since her studies, Robyn has enjoyed performing as a vocalist and instrumentalist in many group and solo acts. Robyn has had the pleasure of teaching at G. R. Saunder’s Elementary, Tamarac Education Centre, North Nova Education Centre, and currently teaches at Dr. W. A. MacLeod Consolidated. She has a private music studio, co-directs the New Glasgow division New Horizons band program, and provides workshops for a variety of schools around NS. Robyn has been an active instructor and clinician with the Nova Scotia Honour Jazz program since 2012. Beginning in 2017, Robyn has gladly accepted the role of NSHJ Assistant Program Director. Ken MacKay – A native of Truro NS, Ken first started teaching in the Public School system in 1976 and has been active as an educator as a Clinician, Adjudicator and Soloist throughout his career. After attending Humber College in Toronto, Ken continued teaching at the Cobequid Educational Center in Truro. In 1980 his Jazz Band came first in the High School Jazz band Category at Musicfest Canada. From there Ken began teaching in the Elementary/Junior High schools, his real passion. Ken is Past-President of the Atlantic Federation of Musicians and is currently on the board of NS Honours Jazz .Ken retired this year from Astral Drive Junior High where he has been Director of Bands for over 20 years. Ken’s list of his professional credits is impressive. Frankie Valli and the Four Seasons, Regis Philbin, Natalie Cole, jazz great Ernie Watts, Mary Wilson (The Supremes),Blues Brother Dan Aykroyd, daughter of the blues Shirley King, Rosemary Clooney, the Temptations, and Lionel Ritchie are just a few of the artists Ken has shared the stage with. Locally he performs and has recorded with Scott n’ the Rocks, The Swell Guys, The Back Alley Big Band, Asia NuGruv,Terry Hatty and The Aviators. Ken’s ability to play a variety of musical styles has established him as one of the most exciting and sought after sax players in Eastern Canada. David Burton has a vast array of recording projects to his credit as composer, producer, musical director and studio musician. His talent and musicianship has granted him priority status with CBC, not only as a drummer, but also as a musical director and arranger. His career has taken him around the world, backing Canadian artist like Rita MacNeil, Natalie MacMaster, Alanya Miles and Ian Thomas, to name a few. He has also had the pleasure of performing live with artists like Tony Bennett, Sara Vaughan and, the great, Ella Fitzgerald. He has received a number of awards including Best Live Jazz CD “HavanaFax Live” (East Coast Music Awards), Best Instrumental Recording “Collage” (East Coast Music Awards) and for the soundtrack “New World Columbus – The Life of Joshua Slocum” (Houston Film Festival). David is a well-respected educator who inspires young musicians as a teacher and clinician throughout Nova Scotia, as well as in Havana, Cuba, as part of the “Los Primos” Project. He has also been an educator with Nova Scotia Honor Jazz for many years along with another program New Horizons designed for retired seniors. David is presently teaching at the NSCC Waterfront Campus in Dartmouth within the music program. John MacLeod, bassist and educator, received his musical training from Saint Francis Xavier University where he completed a Bachelor of Music in Jazz Studies. From there, he travelled to Saint John’s Newfoundland, where he completed his Music Education degree from Memorial University. While living there, he became one of Saint John’s most in demand bass players. John enjoys playing a variety of different music and has performed at music festivals throughout Atlantic Canada. John now lives in Truro, Nova Scotia where he is the band director at Cobequid Educational Centre. 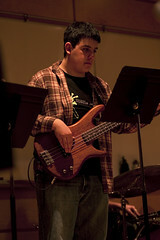 He currently leads the symphonic band, jazz ensemble, jazz combos, pit orchestra, and pep band. John has been an in demand clinician, working with such organizations as Nova Scotia Honour Jazz, New Horizons Music Association, and the Nova Scotia Junior Wind Ensemble.